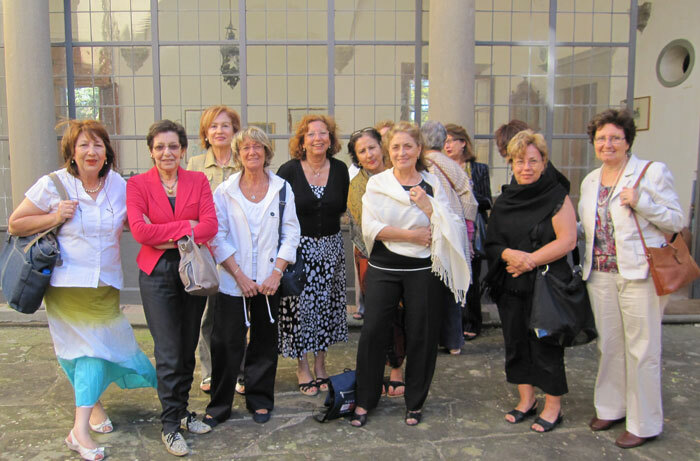 Rosemary Boustaghi (France), Ketty Zambacca (Canada), Thérèse Abdel Messih (Australia), Rina Aloi (Australia), Jenny and Nicholas Richardson-Vafopoulos (England), Sonia and Sylvia Rizgalla (Australia), Anna Serena Leone (Italy), Marcellina Mian (USA/Qatar), Nadia Khoury and Kathryn (her beautiful daughter) (Canada), Marlène Keralla (USA), Seta Margossian (USA), Sylvia Kouhi (Denmark), Sonia Kouhi (Switwerland), Aurora Pisani (Canada), Wilna Buccianti (Italy), Eliane Palermo (Italy), Denise Boiridy and Carrol her husband (Canada), Jocelyne Khoury, her husband Roger Kamel and their son Marc (Canada), Caroline and Nicole Tujian (USA -Seta’s wonderful daughters), Jocelyne Gazel (our second class teacher - Italy), Renada (Canada), Clare Mian (Canada), Teresa LaValle and her husband Natale Polizzi (Italy), Wendy Bradford (Aurora’s lovely daughter - England), Dawn and Yvonne (England). Our second reunion, which took place at “Le Montanine” was the greatest success story of 2010, the culmination of more than two years of hard work, perseverance and persuasion on Eliana’s part; it was whe who found, booked and organised our care-free stay in this idyllic place just a few miles on the hills, outside Florence. This time most of the continents were represented, North America (United States and Canada), Europe and Australia. Our anti podean friends decided to come in full glow and in great spirits Thérèse Abdel Messih (Pourpouras), Sonia Rizgalla (Khoury) with her sister Sylvia and Rina Aloi, what a treat! We were all very fortunate indeed to have with us our beloved teacher (second class) Jocelyne Gazel, who joined the “Mad Crowd” and prepared for us all the most sumptuous dinner upon arrival – it was a feast; the Lebanese, Italians, and Greek cuisines honoured the table, not to mention the Turkish Baklawa (Jocelyne’s speciality) for dessert. The next day, Pentecost Sunday, we had Mass in the little chapel which belongs to the estate where we also prayed and remembered our departed friends Slawka Gribowsky, Ivy Triandafyllou and Nicole Chamaah. The afternoon was spent lazying around the pool and catching up with our individual friends, whom some of us had not seen for over 4 years!! 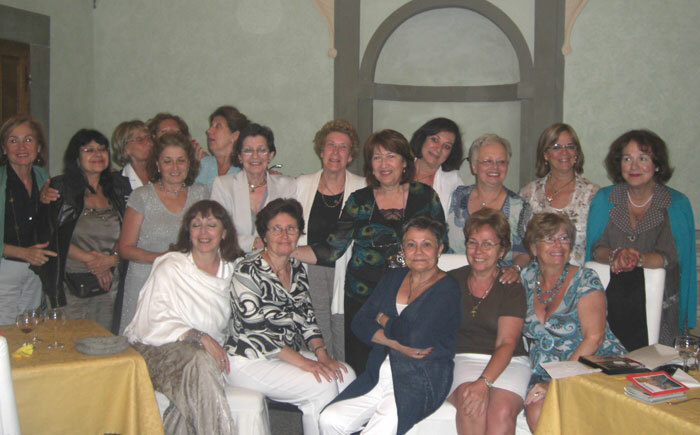 Particularly with Rosemary Boustaghi (Corcessin), Ketty Zambacca (Van Weel), Nadia Khoury (Lekas), Aurora Pisani (Bradford), Wilna Buccianti (Perone), Denise Boiridy (who came with her husband Carrol), Jocelyne Khoury (Kamel) who also came with her husband Roger and Seta Margossian (Tujian). 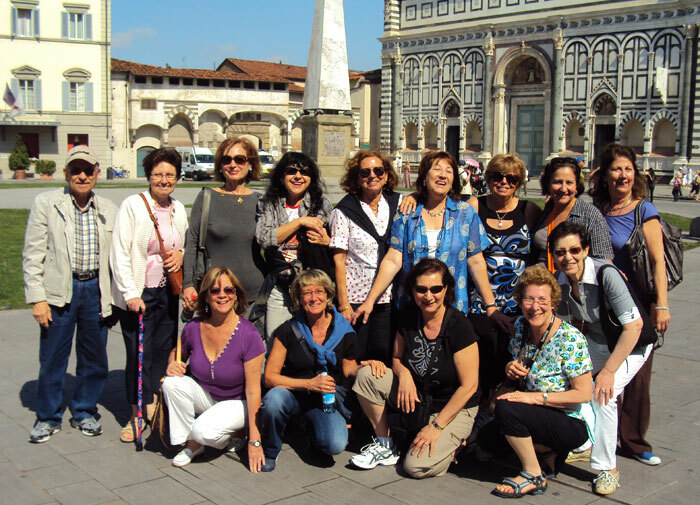 Later that afternoon I gave them a brief talk on the History, Art and Architecture of Florence which I thought would give them a back drop to the visits Eliana and I had organised for the group. 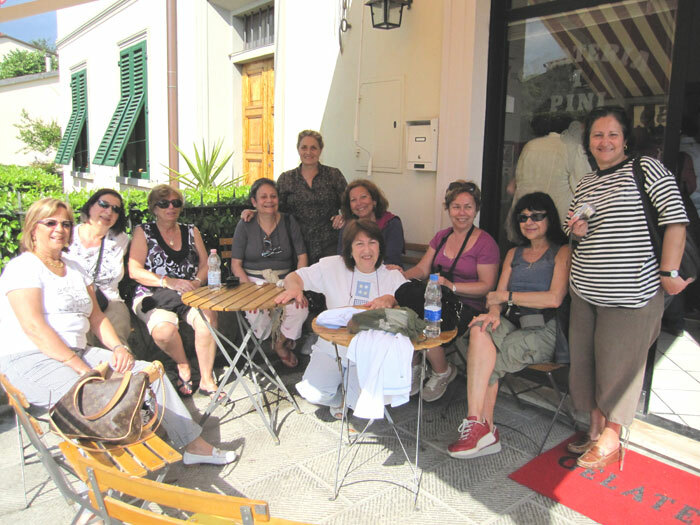 On Monday 24th May, we all took the bus to the centre of Florence. We had a full day visiting the Duomo, Santa Maria del Fiore, the Baptistery, Santa Croce and San Lorenzo …… and some managed to do some shopping too! In the afternoon, we visited the Medici Chapels where we were able to admire some of Michelangelo’s secular sculptures. In the evening, upon the recommendation of Ketty Zambacca’s son, we ate at a wonderful Restaurant “Da Nerone” in Via Faenza. At this point I had to disappear in order to go and collect Nicholas (my husband) who was coming to join us from Geneva. We had a great evening with lots of Tuscan food and laughter. Tuesday 25th May, once again by bus we reached the centre. 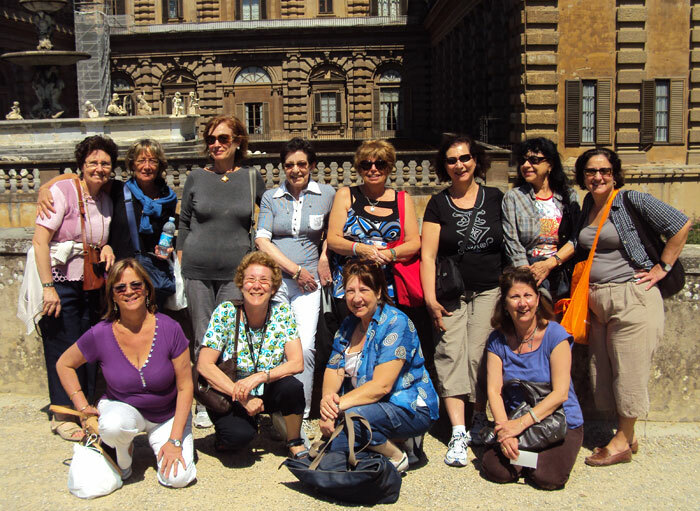 This time it was a visit to Ponte Vecchio and the Palazzo Pitti where we had a picnic in the Boboli Gardens: we all desired to recreate our reminiscences of the Sacred Heart School picnics in Montazah. I think it was great, we all sat down under the shade of the trees in this glorious setting surrounded by fountains and ancient sculptures, we ate and sang our childhood tunes to our hearts’ delight. In the evening we were driven by mini-bus to Marchesa’s Antinori Estate for a wine tasting dinner in her beautiful Renaissance gardens. It was a most enjoyable experience for a number of us as both the Marchesa and her daughter proved to be very warm hearted hostesses. Wednesday 26th was a quiet day at “Le Montanine”. We all helped and prepared a luncheon “al fresco” in the terrace of the lower villa in anticipation of the evening event which was going to be “Le Grand Diner” à la Toscana. At this point, we were joined by Teresa La Valle and her very kind husband Natalino who had driven from Rome in order to be with us all for the occasion. Wendy (Aurora’s daughter) also came with her friends Dawn and Yvonne from Manchester. I should here mention that both Nadia and Seta were accompanied by their respective daughters – Kathryn (Nadia) and Caroline and Nicole (Seta) – as was Jocelyne accompanied by both her husband and her son Marc. In fact, Nadia’s daughter Kathryn, became the official photographer as she “immortalised” all the proceedings. The evening was very emotional for all present, among speeches, souvenirs and reminiscences. Thursday 27th May we had the excursion by bus (hired for the occasion) to San Gimignano and Siena. A glorious day, and for some the last (as they were departing on the 28th). The “last supper” for all of us together was at a Pizzeria en route to the “Montanine”. We all sat on a very long table with laughter, songs and jokes. It was an unforgettable event. Jamais deux sans trois! !